One of the things I love about superheroes is their ability to inspire us to be better. We may not be from Krypton, or Themyscira, we may not have a billionaire's budget, hopefully we're not subject to lightning strikes or gamma radiation. But we can be better. ...and remember, boys and girls, your school -- like our country -- is made up of Americans of many diffrerent races, religions and national origins. So if YOU hear anybody talk against a schoolmate or anyone else because of his religion, race or national origin -- don't wait: tell him THAT KIND OF TALK IS UN-AMERICAN. In the last few years, I've seen the image in color as a kind of classroom poster, but always with poor reproductions, torn, faded, but always wanted one for my classroom anyway. This week, DC Comics did just that. Kind of. They published a blog post that not only tells the story of that original 1949 work, but also a stunning remastered version of the same poster. 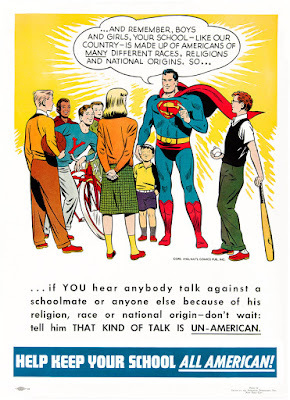 They didn't update the language or art, so it's still old-timey...but it also reminds us that this character has stood for "Truth, Justice, and the American Way" for 79 years. There are some who twist the idea of being "American" into statements like "America First." Which, as it was in the 1930s, is also code for racism, for intolerance, for promoting hate. 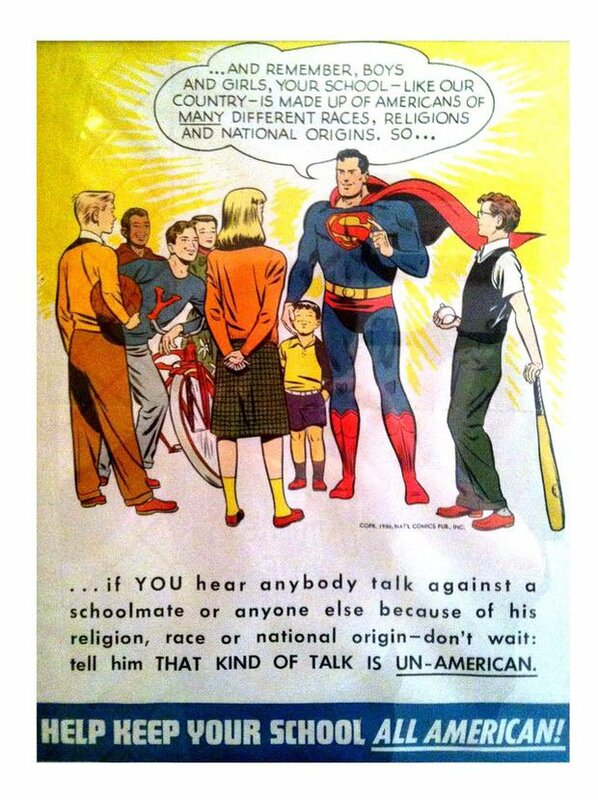 Superman, with his own take on this, is giving a definitive response to this. Anti-racism, pro-tolerance, pushing back against hate with a message that being patriotic is important, and that tolerance of those who are different from us and standing up for those who are being bullied is the most American thing there is. 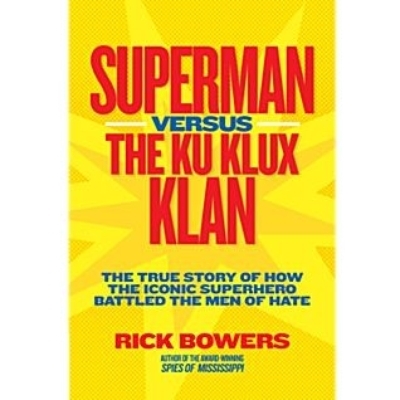 In 2015, I read Rick Bowers' Superman vs the Ku Klux Klan: The True Story of how the Iconic Superhero Battled the Men of Hate. It's a great read, and middle school appropriate. I wrote a whole review on it for Big Shiny Robot. 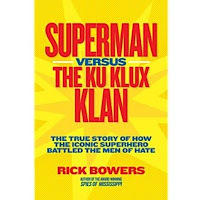 The short version is that the producers of the Superman radio serials in the 1940s decided to take on the Klan. They, with the courageous support of their sponsors (Kelloggs, if I recall correctly) produced two different storylines that had Superman going up against the Ku Klux Klan: The Hate Mongers Organization (a kind of test balloon) and then a sixteen episode arc, The Clan of the Fiery Cross. Hard to miss who they're calling out there. You can listen to all sixteen episodes on YouTube. The final paragraph of my review of the book is one I never thought would be prescient. I hoped it would never be anything other than the end of a book review for a nerdy website. Unfortunately, it seems to be relevant to us in the current climate. This was a great book, a quick easy read for adults, but also an interesting one. Even though there wasn't much about the Superman side of things I didn't already know, the history of the KKK was fairly new to me. It was gratifying to see the creators of the Superman radio series invigorated with their new mission. Do corporations today have the same courage to stand up to bigotry? It's interesting to see how some things have changed over the last 75 years, and how some have sadly stayed the same. As teachers, we all have different political leanings, we come from different backgrounds, we have different ideas about what's best for the country. But we also have a mandate to protect and teach all of our students. No matter their race, religion, national origin (or all of the many other ways our kids are beautifully diverse). I would love to see DC Comics release that Superman poster at cost for schools across the country to have in their classrooms. Not to get people to buy comic books, but to get Americans to realize the duty I have to stand up for you. Especially if you're different from me. For now, you can get a decent letter-sized print of the poster by going to DC's blog post and just printing it...but how great would it be to have it in a poster size? Come on DC Comics, how about it?